Did you know that Malaysia has actually produced a double Grammy winner? Read on to find out about Phil Tan who mixes for the world’s top hip-hop and R&B artistes. The list of R&B, rap and hip-hop artistes that Phil Tan has mixed for is staggering – everyone from Alicia Keys to Gwen Stefani and Mariah Carey, from Busta Rhymes to Snoop Dogg and Run DMC – but he remains extremely down-to-earth about it all. 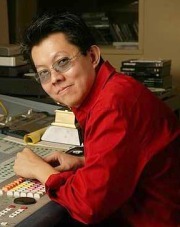 CURIOSITY killed the cat, so goes the old proverb, but if Phil Tan had curtailed his desire for knowledge, he might not have become the Grammy-winning mixing engineer he is today. All it took was developing an interest in the people involved in the production process of the records he listened to – that was enough to set 37-year-old Tan on a less conventional path to realising his career goals. Although – almost inexplicably – his name rings no bells with Malaysians in the music industry, the La Salle Klang-schooled Tan has two little gold-plated gramophones (the Grammy Awards, duh!) for his mixing duties on Mariah Carey’s The Emancipation of Mimi (Best Contemporary R&B Album, 2006) and Ludacris’ Release Therapy (Best Rap Album, 2007). And that’s just the start of his lengthy role call as his credentials run from here to ... Atlanta, Unites States, almost. His Midas touch in the production of R&B and hip-hop tunes includes credits for the likes of Usher, Snoop Dogg, the Neptunes, Fergie, Ne-Yo, Nelly, Destiny’s Child, Gwen Stefani, Alicia Keys, Janet Jackson, Busta Rhymes, Aretha Franklin, Elton John, Cee-Lo, Toni Braxton, Run DMC and many more. And more staggering statistics: adding singles and albums, his handiwork has appeared in more than 150 million units ... just in the United States! But the extremely down-to-earth Atlanta-based engineer thinks he’s just your average Joe who’s had the right breaks at the right times. Let’s be honest though, it’s not just anybody who gets a crack at putting together the pieces that make up a Snoop record. Tan has little problem chronicling his career from a kid in Klang to leaving for the United States in 1987 and how he eventually found his way into the recording studios there. Following his graduation from Full Sail Center for the Recording Arts in Florida in 1990, he set his sights on the recording industry, and thus arrived the opportune meeting with Jermaine Dupree, the man behind rap duo Kriss Kross, but not before an apprenticeship at Babyface and LA Reid’s LaFace facility. However, it was that initial step he took to take his interest abroad, which has brought him success. “My parents wanted me to have a college-level education, and I believe they felt my best chance was to go abroad. My grades in secondary school weren’t that great, so chances of an admission to a local university were doubtful – at least that’s what I was told. “Both my sisters had received their degrees abroad – in Canada and Australia – and I was basically following in their footsteps. “When I left home in 1987 (I was 17), working in the entertainment industry was a relatively obscure concept. My sisters were really the only people who knew I was thinking about a somewhat unusual career path,” he revealed in an e-mail interview. Embarking on a chosen career requires some degree of preparation and groundwork, and there were definitely small steps, which Tan had taken during his formative years in school. “I never felt that the traditional career path (doctor, lawyer, corporate) was something for me. “I was naïve enough at the time (still am, I suppose), to think I only wanted to do something I enjoyed – like music or art (some people close to me consider me a decent artist/graphic designer). “I eventually decided on music because drawing/ painting/ designing was something I preferred doing as a hobby, and not as a job. I loved music, however, and felt that it was something I would be happy doing 24/7. “I had a few very good friends in secondary school that were big popular music fans. They introduced me to a lot of American and European artistes and their music. Delving headfirst into his passion has taken Tan on quite a ride, and after being in the trade for nearly two decades, he feels that there is always good with the bad. “The music industry is in a slump, partly because of illegal downloading (piracy), so budgets are shrinking and there’s not as much to go around. “There’s more competition for the entertainment dollar as well – consumers have more choices. It’s getting harder for recording engineers to get steady work, as recording technology is inexpensive and simple enough for almost anyone to use and produce high-quality material. To the uninitiated, the life of a mix engineer may seem glamorous ... rubbing shoulders with celebrities and working with top notch musicians, but it all comes down to hard work and a sound knowledge of audio. “As a mixing engineer, what I do is take all the individually recorded parts of a song and put them together to create what you hear on the radio, an album, or a video. Sort of like an editor in film cutting raw footage together to tell a story, or a cook mixing ingredients and spices – in the right amounts – to create a dish. Life always strikes a balance, for all the positives; there are always the negatives as well ... likewise the recording industry. Closer to home, if there’s one thing that Tan misses most about Malaysia, unsurprisingly, it’s the food. But his heart is still firmly in his current home base where life has treated him well.